Bonnie Released From Prison Aug 27! Ashland County Drops Charges Against 'Silence Trident' Polecutters!! Should the U.S. Have a Missile Defense System? NO! Shoppers Beware: USDA Approves Nuked Meat! Will Human Subjects Be Informed? 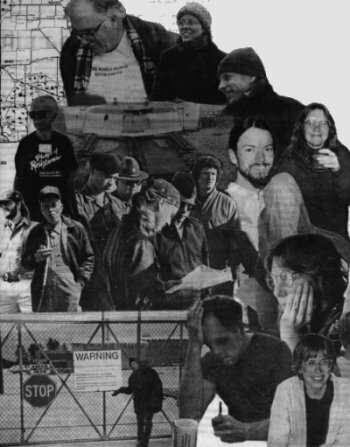 During the '80s and '90s, dozens of protests at the Grand Forks air force base and missile field (right, top) were sponsored by Nukewatch, Bemidji Friends and others. 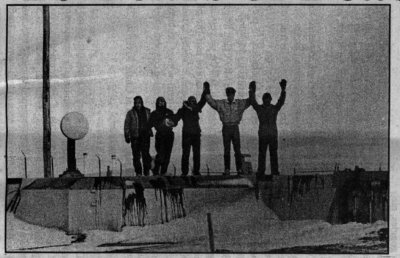 Atop a Minuteman-3 missile silo outside Larimore, North Dakota (l. to r.), John LaForge, Barb Katt, Mark Rogness, Jason Loughead and Dan Schechter celebrated Martin Luther King's birthday anniversary, Jan. 1990. The five said they were "protesting the elaborate housing of the Bomb in the face of massive human homelessness." Facing a year in jail, all charges were dropped the day of trial. 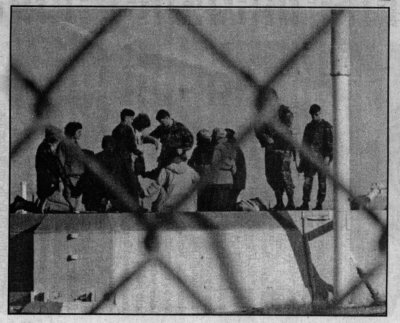 Loughead, of Winnipeg, said of the reprieve, "I hope the air force has learned its lesson." Perhaps it did. Today the Grand Forks field is being emptied of its ICBMs. Whiteman air force base in Missouri used to be the guardian of 150 Minuteman-2 missiles near Kansas City. In Oct. 1991, 16 "Peace Planters" entered launch site O-3 (right, middle) in what was the largest single silo occupation in U.S. history. After scores of similar nonviolent actions, the media, the courts, the air force and the general public came to know the deadly truth about the weapons in their backyards. All the Minuteman-2s have since been removed from Missouri and South Dakota. See related stories above.